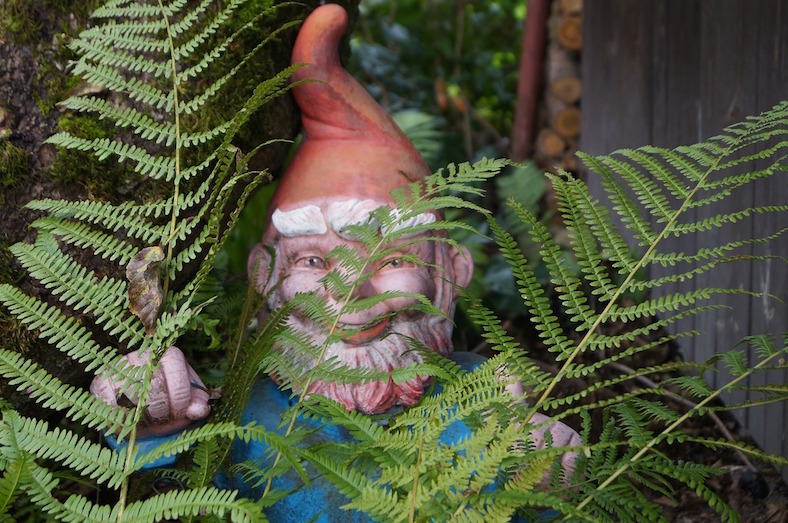 My husband’s mother loved garden gnomes — those ceramic statues similar to the ones that had a prominent role in “The Full Monty”. She had two of them that lived inside her condo and lazily lounged around the living room for years. No problem that they had gotten to be pretty much the worse for wear over the years, she had their faces repainted — and whoever did it endowed them with strange lipstick-y mouths that gave them an evil leer, rather than making them look like the playful though benevolent beings they had originally been. My mother in law cannot have them in the dementia facility where she now lives — the other bric-a-brac things of hers that we took there have been broken — so the gnomes materialize here and there in our family and enjoy turning up at the homes of the relatives who were most scornful of their appearance. Recently they surfaced mysteriously next to shrubbery at my son’s home — who knows where they will show up next. I think my mother in law would appreciate their new lives of mischief. After all, isn’t that the existence that gnomes are supposed to have?